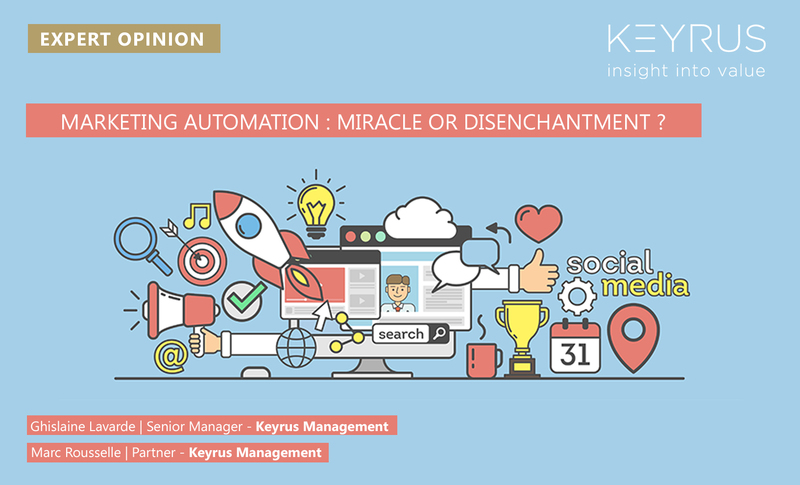 KEYRUS | Marketing Automation: miracle or disenchantment? Marketing Automation: miracle or disenchantment? How can they make themselves heard in this cacophony of marketing communications? How can Marketing Automation solutions help them develop a relationship of trust between the company and its customers, and move away from a marketing approach driven by solicitation towards one based on interaction? The digital era has radically transformed the balance of power between companies and their customers. The wealth of information available on the web has enabled customers to plan their purchases all on their own. It has also allowed them to take the upper hand, by dictating to companies both the choice of customer relationship channels, and the speed of purchasing decisions. To regain the initiative over these customers with their opportunistic, and even fickle, behavior, Marketing Departments have had to develop sophisticated customer relationship strategies. These strategies have led them to adopt Marketing Automation solutions. Marketing Automation can be defined as covering all set-ups or techniques that automate the sending of multi-channel marketing campaign communications. Whether such campaigns are part of initiatives to target prospects, or of others designed to gain the loyalty of existing customers, they are pre-defined by scenarios tailored to each target, and they feed into the entire customer journey. The benefits flowing from these campaigns are reflected in increased lead generation and revenue gains, both from capturing new customers and generating up- and cross-selling. The end of carpet bombing: the "email canon" that used to fire left, right, and center now carries out surgical strikes. To ensure real multi-channel consistency. So, contrary to what too many companies still think, the ultimate purpose of Marketing Automation extends far beyond the challenges of customer prospecting. It can, and should, be used throughout the customer life cycle: from the moment when new customers are first signed up, through to the point where the company seeks to gain their loyalty, or, possibly, even beyond that, where it tries to win back lost customers. As an overall lever for improving the customer experience, Marketing Automation solutions sit at the junction between marketing and commercial strategies on the one hand, and operational excellence on the other. They affect all processes associated with customer relations, from the front to the back office, within both centralized and decentralized organizations. The enhanced commercial performance obtained through such solutions must, however, be accompanied by an increase in the marketing ROI, achieved through more effective targeting and a more informed allocation of budgets, thanks to the monitoring and analysis of campaign results: with Marketing Automation, the "email canon" that used to fire left, right, and center now carries out surgical strikes. Today, more than 9 large companies out of 10 are equipped with a Marketing Automation tool chosen from nearly 215 solutions proposed by the various editors. These tools therefore seem to be a success, and each company can equip itself with the one best suited to it. However, according to recent studies and accounts, 70% of users of Marketing Automation tools are either dissatisfied, or only partially satisfied, with them. This sorry state of affairs raises the following questions: do the solutions proposed by editors meet the expectations of Marketing Departments? Are companies doing enough to "prepare the ground" for the implementation of these tools? For although there is disappointment with the ROI on Marketing Automation projects (assuming that the ROI is being correctly measured), is this not, perhaps, due to companies having been too quick to treat marketing automation as the miracle remedy for malfunctions they could not put down to their campaign management tool? By way of an example, the absence of quality data, or a lack of confidence, causes many companies to persist in systematically scattering their marketing communications across too broad a spectrum of prospects, or even across all the prospects in their database, without using the targeting capabilities offered by their solution. The sure result of this approach is that a large portion of the addressees will be sent messages which are not relevant to them. And finally, too optimistic an assessment of the ROI at the project scoping phase, in part, in order to justify the investments made. It is thus in the initial stages, before the tools themselves are actually used, that the future performance and success of Marketing Automation solutions is decided. Consequently, it is important to ensure that the implementation stages essential to the project's success are carefully followed. If the foundations are weak, the house falls down! Marketing Automation feeds off customer/prospect insight available in the company at any given moment. In the course of this stage, the company must assess its level of maturity based on its marketing strategy, ecosystem of data (First, Second, and Third Party), and existing technologies and processes. The Marketing Automation tool is to the customer relationship what the engine is to a car. You can not propel a racing car with a moped engine (or vice versa). This scoping stage of the project thus enables the company to choose the tool that is on the most suitable scale, and is the most appropriate, for its goals and implementation capability. This allows the company to determine the optimal level of investment and a suitable method of implementation for the project. Data are the fuel for Marketing Automation: they offer the key to understanding customer "insights" and behaviors by providing the context (geolocation, life moment…) and elements for monitoring performance. These data must be organized and managed within models whose structure reflects the challenges of homogenizing and developing the omni-channel customer experience. In this way, the Data management and governance plan will facilitate and guide the choices of architecture for the application ecosystem into which the Marketing Automation tool will fit. Since it makes the company have to rethink its interactions with customers and prospects throughout the life cycle, the implementation of a Marketing Automation solution results in considerable changes to the company, right down to its culture. For this reason, the implementation must be treated as a company project, sponsored by General Management. The multi-disciplinary team that leads this project will notably have the task, right from the scoping phase, of coordinating the change management, so as to ensure an optimum level of take-up by users. The maturity matrix illustrated here highlights the trajectory for achieving the aims of "enchanting" the customer experience. It is punctuated by stages at which the Marketing Automation tools will have to develop in parallel with the company's level of maturity. More broadly, the entire relationship marketing set-up will need to be agile, so as to incorporate developments in the ecosystem, marketing practices, and regulatory constraints. Within the space of a few years, the challenge of relationship marketing has moved from targeting the right customers and prospects, to establishing a regular dialogue that is placed within a context (that of key moments for the targets), and also personalized according to the profiles and behaviors of the targets. From here on, the future is about "Smart Marketing Automation", with the promise of Prescriptive Marketing using personalized, self-evolving dialogue that will break free from the shackles of pre-established scenarios, however sophisticated they may have become. Smart Marketing Automation will utilize emerging technologies linked to Big Data, such as Artificial Intelligence (AI) and Machine Learning, and agents for integrating and simplifying information, which will make it possible to go beyond the limits intrinsic to current solutions. We are already seeing the emergence of new start-ups proposing technologies simplifying customer relations management (Bontact, Dove…). However, to ensure that this "Holy Grail" of Marketing does not remain within the realm of fiction, companies will have to have followed the stages for developing their operational set-up. Only by doing this will they have in place the fundamentals of the omni-channel relationship which, combined with the relevant Data, will provide the structure for their Marketing Automation of tomorrow. Marc Rousselle, an Associate in charge of Marketing & Sales Strategy know-how within Keyrus Management, has a career background of more than 25 years in operational and consulting activities and new business creation. After having held posts in marketing, sales, and sales team management within major groups, he works as a consultant on challenges associated with the digital transformation of enterprises and linked mainly to the launching of new services onto the market. As part of this work, Marc helps numerous enterprises create service platforms, devise their data strategy, and redesign the customer omni-channel experience. He works in particular with industrial players, those providing services to businesses and private individuals, and financial services players. Ghislaine Lavarde is a Senior Manager and Marketing Automation and CRM Expert within Keyrus Management, with a career background mixing consulting roles and operational posts as Marketing Director. Ghislaine thus possesses skills in marketing functions and tried-and-tested know-how in solution and data aspects. As a consultant, she works on challenges associated with creating the customer experience, defining the relationship marketing strategy, and transforming marketing practices. At the same time, she assists enterprises in choosing and implementing the associated marketing solutions and tools. Ghislaine provides assistance in particular to major players operating in the B2B markets and in an international context, with such assistance covering all stages of their projects. Keyrus Management is the Consulting Firm incorporated within the Keyrus Group and it combines business know-how with technological expertise in data management. The complementary nature of these two aspects provides an edge in terms of value, and gives Keyrus Management a unique positioning in the consulting landscape. Keyrus Management helps enterprises of all sizes, whether they be Large Accounts or small- and medium-sized companies, to meet their increased needs for rapid transformation by developing their agility and accelerating Digital use. The firm is developing its activities in France and internationally, supported by the Keyrus Group, a specialist in Data and Digital present in some fifteen countries on four continents.